All transactions are safe and secure with a reliable history in online purchasing behind each of our associates. Buy The Godfather Keep Your Friends Close t-shirt to own Godfather clothing and merchandise. 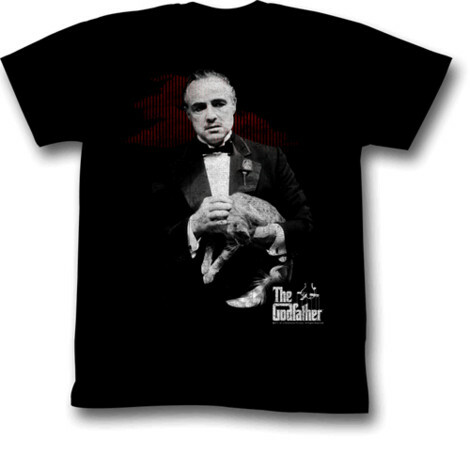 The front of this black Godfather t-shirt displays a black and white movie image of Don Vito Corleone (Marlon Brando) holding his cat. The tee is a reminder of the Don's well-known motto, "Keep your friends close, but your enemies closer." In The Godfather Part II, Michael Corleone tells Frankie Pentangeli that his father taught him this lesson. This phrase is often repeated in other movies and television shows, especially those with the mob or gangs. "Leave the gun. Take the cannoli," is also a popular quote. In addition to The Godfather Keep Your Friends Close tee above, browse the Godfather Clothing Gallery for more apparel like men's and women's clothes, kids shirts or hoodies.